At present about 4000 tonnes of desiccated coconut is manufactured annually and used mainly by confectionery, biscuit and food processing industries. Coconut grating machine grinds or grate the deshelled coconut flesh into desiccated coconut. The machine works on the speed reduction technique by using pulley belt arrangement. The overall size of the machine should be maintained as it helps to easily operate and smooth handling for workers. 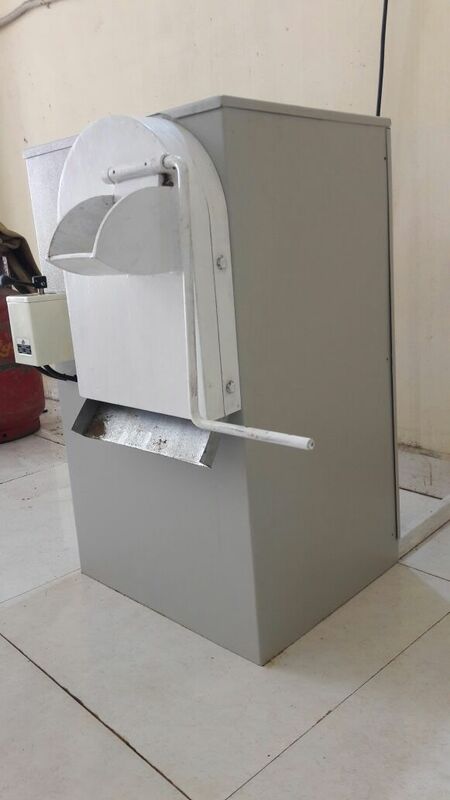 In less time, we can produce the maximum amount of coconut grate by using this machine. We can also make use of well sealed gearbox speed reduction. Depending upon the shape and quantity of shreds of the coconut, the grating disc changes respectively. Being highly efficient at shorter distance, V- belt is used in this mechanism. Grating machine is useful for large scale production industries for coconut in large scale; it helps to satisfy the requirement of customer on time. Coconut dehusking and grating is the most fundamental issue in terms of finding labor and improving productivity. In food industries, we need large manpower because in every part of section we cannot use automatically operated machine. So to overcome this advantages coconut dehiscing and grating machine is good solution. Main frame is constructed with rectangular shape. Material used for main frame is steel. The side edges/plates are welded together to form the frame. The welding of plates provides very rigid joints. Main frame is sealed properly and passages are provided in case of maintenance. It is the important part of the machine as it grates the coconut. Grating disc arrangement is designed for efficient grating of coconut. Grating disc is manufactured depending upon the application. Grating discs are made with different types of impressions on it. For the rotation of grating disc an electric motor is used. Electric motor converts the electrical power into mechanical power required to drive the mechanism. A shaft is a rotating machine element which is used to transmit power from one element to another element. In order to transmit power from shaft to other, various mechanical elements are used such as gears, couplings, belt drives, chain drives, etc. This machine uses two stage speed reduction and hence the shafts used are two. Power transmission through belt pulley arrangement is the simplest method than other elements. There are different types of pulleys according to the type of belt selected. As we have selected V-belt, v groove pulley is used. Belts are the flexible links used to transmit the power over considerable distance. The belt should have high flexibility to easily bend while passing over other pulley. Belts are manufactured in the form of long bands and rolled as coils. V-belts are used due to its high efficiency over short distance and slip factor of v-belt is small as compared to other types of belts. Bearing is a machine element that supports another rotating machine element. It permits relative motion between the contact surface of the members while carrying loads. The bearings used are single row deep groove ball bearings.